Produces a uniform, slightly granular appearance and texture that is offered in various colors. POLAFLOOR EPOXY TOPPING is a high strength floor topping used to provide extreme resistance to wear, impact and chemical attack. It may be used to patch holes or cover and level process areas in chemical plants, machine shops, plating works, breweries, and other areas requiring high durability and low maintenance. POLAFLOOR EPOXY TOPPING produces a uniform, slightly granular appearance and texture that is offered in various colors. Repair and replace broken edges and gouges on stairways and loading docks. Fill and reinforce bases for railings, equipment mountings and pedestals. Form coves and adjust floor level for controlled water flow. Can be used over concrete, most metals and other surfaces. The surface to be coated must be clean, dry and sound. If the strength of the concrete is in doubt, perform pull-off tests to assess the suitability for the intended use. Remove all traces of oil, grease, dust, laitance or other contamination with suitable cleaning agents and/or by mechanical grit-blasting, scabbling or grinding. Concrete may need acid treatment, particularly if dense or new. Thoroughly flush with clean water; do not allow evaporation of acid or dirty water to re-contaminate the surface. Add Part ‘B’ of the Epoxy Primer to Part ‘A’ and stir until contents are thoroughly mixed. Apply all of the mixed primer by brush or fibrous roller within 15 minutes of mixing. Do not allow the Epoxy Primer to pool or cure before applying the Epoxy Topping. The Epoxy Topping is best laid while the Epoxy Primer is tacky, normally between 15 minutes and 2 hours of application. Using a cretangle or mixal type mixer, load the mixer with the entire contents of the Epoxy Topping Aggregate Pack. Add Part ‘B’ of the Epoxy Topping to Part ‘A’ and stir until contents are thoroughly blended. Pour this mixture into the running mixer. Use a spatula to “strip out” any remaining resin. Mix until all components are uniformly blended, at least 2 minutes. The mix must be laid before cure commences (approximately 20 minutes at 70°F). Rake out the mixed POLAFLOOR EPOXY TOPPING to a uniform, uncompressed depth of approximately twice the required finished thickness (i.e., for 200 mils, rake to 400 mils). Compact by heavy pressure with a steel trowel. Finish off with light, angled troweled movements to remove trowel marks, indentations, etc. It is usually not necessary nor desirable to use solvent during application. 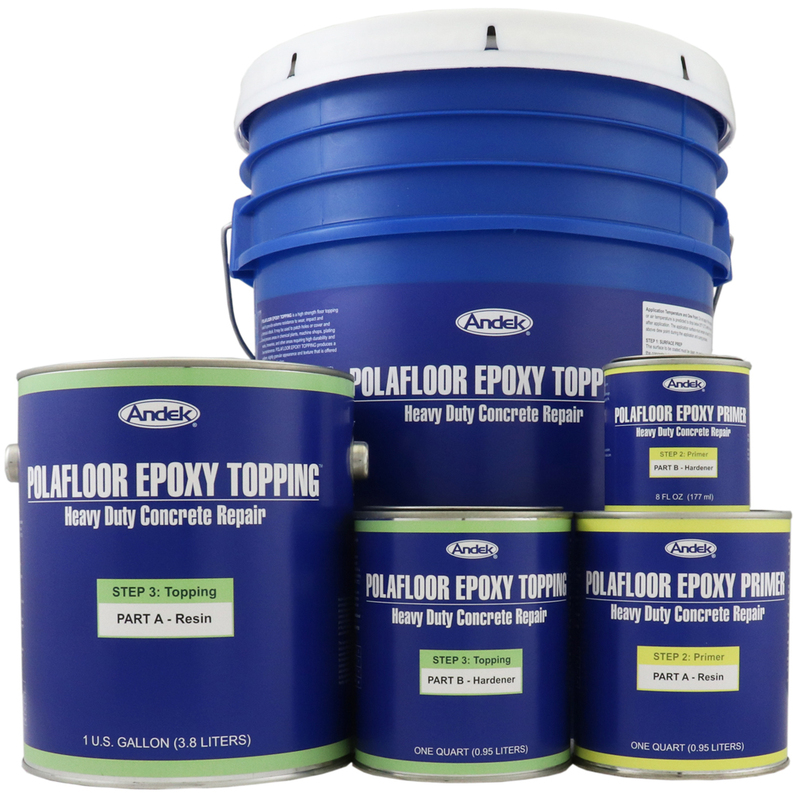 POLAFLOOR EPOXY TOPPING may be readily formed to provide coving, skirting or steps It will trowel to vertical surfaces of any height provided sufficient ‘key’ is first obtained by surface roughness and timing of the application of the Epoxy Primer. Difficult odd shapes and deep holes can be coated or filled by incorporating ‘K’ Additive into the mix at the resin plus hardener stage. In areas exposed to weathering, heavy chemical attack, wet operations or where extreme cleanliness is required, seal POLAFLOOR EPOXY TOPPING with Polafloor PD or Clearcoat 44. Remember that a gloss finish will reveal imperfections. If a traction improving finish is required, grit particles may be incorporated into the seal coat. Tools may be cleaned with xylene before cure takes place. Must be sealed when used in conditions of permanent weather exposure or immersion. Will not adhere to wet or soiled substrates. Do not use below 50°F.